Not that he's - ya know - dead 'n gone, but Tony Romo's statement on Tuesday was certainly saturated with resignation. Oh, and also guts, class, respect, dignity and professionalism. 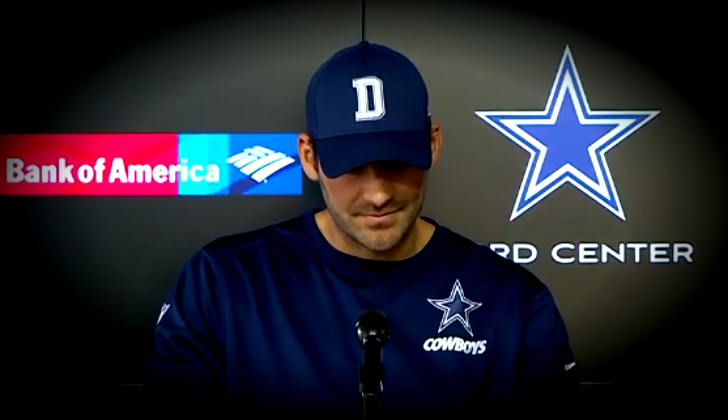 For some of us who've loyally - even stubbornly, at times - supported the most prolific passer in the history of the Dallas Cowboys, it felt a lot like a retirement speech. Or at least the official beginning of the end. He's won playoff games and made Pro Bowls and shoved Roger Staubach and Troy Aikman from the record book, but not sure I've ever been more proud of No. 9. And also never been more sad for him. No way around it, at this point in their polar careers Dak Prescott is a better quarterback than Tony Romo. You know it. I know it. And, yep, Romo - gulp - knows it. Under heavy pressure in a town that loves, loves, loves it some quarterback controversy, Romo made one of the best, most accurate deliveries of his career. On time. And on target. I was at Texas Stadium the night Romo replaced Drew Bledsoe and it felt - yeah - kind of eerie. With Romo injured and certain to get his job back (we figured), there was no similar passing-of-the-torch moment on the field this season. But while Romo sat silently and helplessly, Prescott yanked him off the pedestal and down the totem pole. The rookie who's only a Cowboy because of dumb luck (management whiffing on several other more desirable options) and only under center because of two injuries (Kellen Moore ring a bell?) is now on the verge of a magical season. The Cowboys are 8-1, and they just might win a championship. As a Cowboys lifer, I'm rooting for another Super Bowl. But, I admit, without No. 9 throwing the winning touchdown or taking the final knee, it will feel a tad hollow. Much like it will if the Rangers ever win a World Series without Michael Young, or maybe Elvis Andrus. Like it would've had the Mavs triumphed after Dirk Nowitzki. You just root for great things to happen to good people. But sometimes life - and sports - kicks that hope square in the kisser. Nobody's been persecuted in DFW sports more than Romo. So on this bittersweet day, I figured I'd dust off one of my many defenses of No. 9. What it was like to be a Romo fan in 2013? thanks for sharing this news! I think the situation will change, I don't know what to expect!